New Delhi: Union minister of state for home Kiren Rijiju, his cousin Goboi Rijiju, a contractor in Arunachal Pradesh, the managing director and chairman and some other top officials of the North Eastern Electric Power Corporation (NEEPCO) have been named by Satish Verma, the chief vigilance officer (CVO) of the public sector unit, in a report which alleges corruption in the construction of two dams for the 600 megawatt Kameng Hydro Electric Project, media reports said on Tuesday. Verma, in the 129-page report, alleged that the “elaborate conspiracy” of fraud may have extended up to Rs 450 crores, according to the Hindu. The conspiracy allegedly involved contractors, NEEPCO officials and the administration of West Kameng – the site of the project and Rijiju’s parliamentary constituency. Verma – a Gujarat cadre IPS officer who assisted the CBI in the Ishrat Jahan fake encounter case – sent the report to the CBI along with the Chief Vigilance Commission and the ministry of power this July. Intriguingly, Verma was soon pulled up by NEEPCO for his “unauthorised absence” and immediately transferred to the CRPF in Tripura. In a 1,100-page petition presented before the Guwahati-bench of the Central Administrative Tribunal (CAT), Verma alleged that his tenure as the CVO was cut short by a year because he flagged the NEEPCO scam involving Rijiju’s relative and also for investigating a fraudulent land deal in Gujarat. As per the Indian Express, the CBI has made two “surprise checks” at the NEEPCO office in Arunachal Pradesh after Verma’s report but no FIR has been registered yet. Verma’s report said several fake and inflated bills were served by contractors to allegedly siphon off money in the name of transporting rocks required for the construction of the dams. 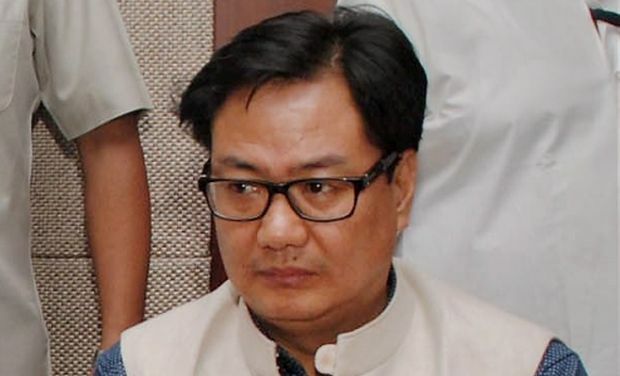 Many transport challans and records submitted by the contractor, Mumbai-based Patel Engineering Limited (PEL) – (Rijiju’s cousin Goboi is its sub-contractor) – were found to be fake. In some cases, the report said, the same vehicle number or the same driver have been named in different challans claiming to have begun the journey from different quarries situated 70 km away on the same date just half an hour apart. After Verma’s advisory to the head of the project which pointed out the anomalies, reimbursement of those bills, which primarily belonged to the period between May and July 2015, was stopped by NEEPCO. Verma named the then NEEPCO chairman and manging director (CMD), P.C Pankaj in his petition stating that he was complicit in the fraud involving PEL. Following the media reports, Rijiju took to twitter to deny the allegations. He put out a letter that he claimed was written to him by some “local inhabitants” of the project site in September 2015 seeking his intervention to get the pending payment meant for boulder transportation. “Really cheap! This is the copy of representation I received and forwarding letter to power minister. Is it a corruption helping poor tribals?” he tweeted. Meanwhile, the Congress demanded the resignation of Rijiju at a press meet in New Delhi where it played an audio clip that purportedly links him to the alleged fraud. “Kiren Rijiju’s role in this issue is under a cloud of suspicion. So he should be sacked or asked to resign till the probe is complete,” party spokesperson R.S. Surjewala told the media. Work on the PSU’s Kameng Hydro Electric Project began in 2005 after the tender for civil work at Bichom Dam, Tenga Dam and a powerhouse at Kimi were bagged by PEL. The project is nearing completion.